I did a Save vs. Splurge post a few weeks ago and I want to make this a series! I love decorating on a budget and fully believe that you can get a high end look without spending a ton of money. So, I want to take on the challenge of finding less expensive options for more expensive items. 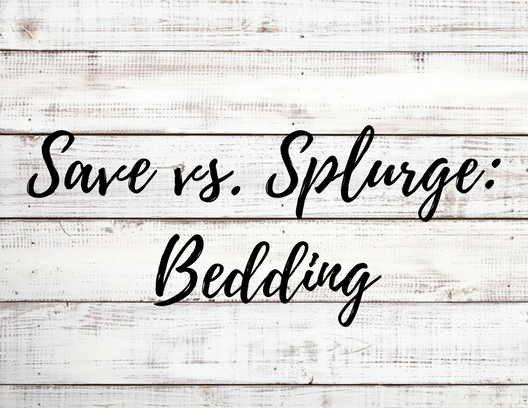 This week I am comparing bedding. I've found some beautiful but expensive bedding, and I'm going to compare it to a less expensive option. Can you tell which is more expensive? Both of these comforters have beautiful ruffle detail and are both a crisp white. As I said in my post "5 Ingredients for a Perfect Farmhouse Style" decorating with white is an important ingredient to the farmhouse style. The bedding on the left is $650 and the bedding on the right is only $99! Both of these duvet covers go perfectly with the farmhouse style. They are classic and simple with the stripes and neutral colors. One of these is over $500 and the other is under $100. Can you guess which is which? The one on the left is $84.99 and the one on the right is $526! These two comforters have great texture that add so much to a space. I love adding texture when decorating. One of these comforters is under $100 and the other is over $200. Can you tell the difference? The one on the left is $89.99 and the one on the right is $203.99. As I said above, I love decorating on a budget, especially when I can find options that are so similar to those more expensive items. Most of the time you can't tell the difference and I love that you can get the same look for a lot less.